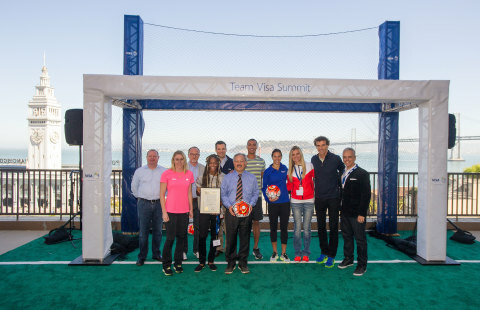 SAN FRANCISCO--(BUSINESS WIRE)--Sep. 23, 2015-- Today, Visa Inc. (NYSE:V) gathered 25 Olympic and Paralympic hopefuls from around the world for a two-day Team Visa Summit and innovation showcase at the company’s headquarters in San Francisco. The Summit kicked-off Visa’s year-long program which supports Olympic and Paralympic global athletes as they train for the 2016 Games. To mark the occasion, San Francisco Mayor Ed Lee and representatives of the International Olympic Committee declared today “Team Visa Day” in San Francisco. Team Visa Rio includes Olympic and Paralympic athletes including Carli Lloyd (USA), Ashton Eaton (USA), Emanuel Rego (Brazil), Tiago Splitter (Brazil), Sally Pearson (Australia), Ryan Cochrane (Canada), Kim Jae-Bum (Korea), Daiya Seto (Japan), Ivan Garcia (Mexico), Yana Kudryavtseva (Russia) and more (see additional list below). As new mobile technologies such as biometrics and wearables advance the payment experience, innovation is also helping Olympic athletes with training and performance monitoring as they prepare for the Olympic Games. Visa is positioned at the intersection of technology and sports, bringing mobile payment innovation to the Olympic venues and infrastructure, while sponsoring athletes to achieve their everywhere. Olympic hopefuls attending the Team Visa Summit learned to use new payment technology that are expected to be implemented at the Rio 2016 Olympic Games including Visa Checkout and Samsung Pay. They also received a preview of future payment technology applications including biometric payment options and wearables. Visa’s commitment to the Olympic Movement began in 1986, and includes sponsorship of all Olympic Games from 1988 – 2020, along with more than 300 sponsored athletes through the Team Visa program. Visa selects its athletes based on criteria including the athlete’s personal journey to the Olympic and Paralympics Games, athletic achievements, and community involvement.